Maria de Nazare, gave birth by caesarean at a hospital in Anajas, in Brazil’s northern Para state, with her newborn weighing 9.9lbs. Following the birth of her baby, mother Maria, 25, admitted that she had been told she was set to welcome twins. But following a number of tests, doctors have revealed that the baby has two brains and two spines but shares one heart, lungs, liver and pelvis. The hospital’s director, Claudionor Assis de Vasconcelos, told Brazil’s O Povo newspaper that the woman decided to travel to the hospital because she was feeling strong abdominal pains. The 25-year-old mother, who lives in a rural area of the state, had no ultra-sound scans during her pregnancy and only found out about the abnormality minutes before the baby was born at 1am on Monday morning. He said: ‘When doctors scanned her they realised that the baby had two heads and that a normal birth would be a great risk both for mother and baby. The caesarean took an hour because the baby was sitting down. Neila Dahas, director of the Santa Casa hospital said: ‘If both their brains are functioning, how are we going to choose which head to remove? He said: ‘On the contrary, the baby was received with much happiness by the family. 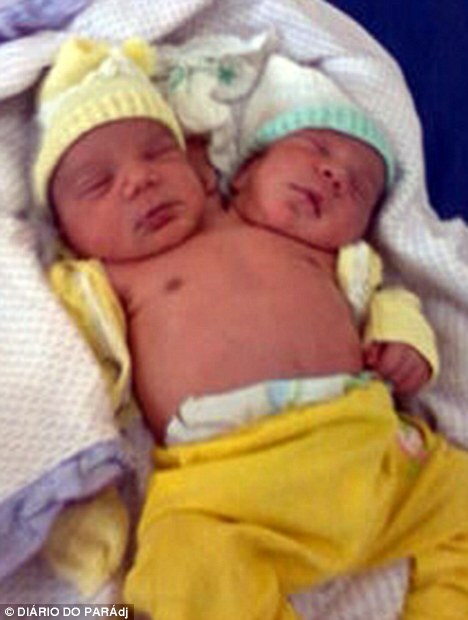 Remarkably, this is the second time a two-headed baby has been born in Brazil this year. Sueli Ferreira, 27, gave birth to a two-headed baby in Paraiba State, but it died a few hours later because of lack of oxygen to one of the child’s heads. The birth of such twins is extremely rare in south-west Asia and Africa. In the U.S. Abigail and Brittany Hensel have become media celebrities, appearing on the Oprah Winfrey Show and featuring in television documentaries.